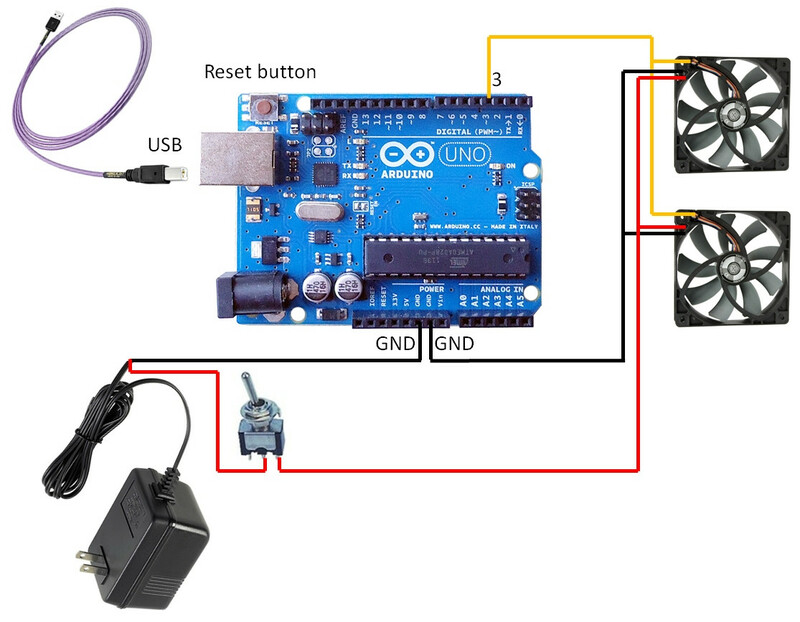 I am learning Arduino programming and my current project for real use is to connect 10-17 PC chassis PWM fans to be temperature controlled by the arduino. The temperature sensor is a TMP36 (included in the official Arduino beginner's kit). It is connected to +5V and GND on the Arduino Uno R3. Middle pin is the output and is connected to A0 on the Uno. Temperature readings seem to work well up until the point the fans start spinning. When they do, the output pin on the TMP36 sensor outputs junk values. Such as 0V or 700mV and it fluctuates up and down if I try probing it with a multimeter. When fans some to a stop however, the output once again stabilizes to a fairly correct value. I am no expert in electronics interference, but electric motors I suppose cause some electrical noise? I had hoped that PC Chassis fans would already have electric components inside the hub to prevent such though... Currently I am trying to run 2 fans at the same time but I wish to use 10-17 later once this works. The fans I am using are Arctic 92mm PWM Rev 02. I have checked the datasheet (https://www.arduino.cc/en/uploads/Main/TemperatureSensor.pdf) for TMP36 (TO-92 package type) and tried adding a ceramic 0.1µF capacitor between +5V and GND and also add resistor of varying values to the output pin. I believe I got some stabilization out of it but not enough. Especially when the fans start spinnig faster than 20% duty cycle on pwm it starts to flip out. I have tried to disconnect power to fans to check if PWM signal may cause it too, but this is not the case as the TMP36 remain stable with PWM on but fans disconnected. Can someone please help me with explaining what is probably going on and how I can mitigate the problem in a preferably easy way? Do I need to add diodes, capacitors, resistors? Where? Or should I change to a different temperature sensor (which)? Browse other questions tagged arduino-uno pwm temperature-sensor or ask your own question.